Need help planning your Breckenridge vacation? Looking for those extra touches to make your vacation stay in Breckenridge perfect? Breckenridge Concierge can help make your Colorado vacation extra special! Breckenridge Concierge services at Breckenridge Resort would like to help make your vacation stay and travel plans simple, special, unforgettable and easier for you. All of our representatives can recommend the best restaurants and ski & snowboard rentals, provide directions to popular attractions and activities, and let you in on all the "locals favorites," from the best apres-ski to the nightlife to the best skiing on the mountain. We can help you plan your vacation time in Breckenridge so you get the most Breckenridge Resort has to offer! Listed below are some of the services and activities Breckenridge Concierge Services can suggest, help you plan and arrange for your Vacation stay in Breckenridge Resort. You want the most out of your vacation time - Breckenridge Concierge, your full-service Breckenridge Vacation Planner in Breckenridge Colorado Ski Resort, is ready to assist with all your day-to-day needs. With todays busy lifestyle, everyone finds it difficult to balance work, family life, and recreation. Save time by allowing our professional assistants to take care of the details. Everything from running errands, making travel arrangements and reservations! Contact Breckenridge Concierge Services today. Email VisitBreck Concierge at : concierge@visitbreck.com. 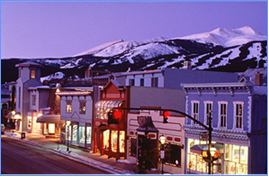 And begin planning your perfect Breckenridge Resort Vacation visit with Breckenridge Concierge Services. © 2003 - 2010 breckenridgeconcierge.com. All Right Reserved.